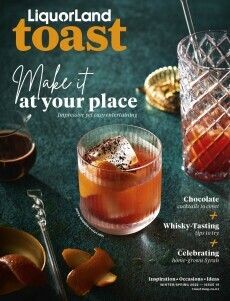 Raise a glass to winter with our latest issue of Toast print magazine, now available complimentary at Liquorland stores nationwide. This issue we dive into warming flavours and ingredients with our Cosy Cocktails shoot, which features drinks like a hot Vodka Plum Toddy and Whisky White Hot Chocolate; and the delicious aromas of wine and spirits for recipes on Boozy Puddings and Slow Cooked Meats. Because winter weather can be a little depressing at times, we opted for some travel inspo through our colourful Sunny Stopover cocktail shoot, which features our cover-star cocktail the Jamaican-inspired Triple Rum Punch, and an Indian-slanted Spiced Mango Gin Slinger. For wines we delve into delectable syrah, chardonnay and merlot varietals, and provide a cheat-sheet on drink of the moment, fortified wines. We share some top winter beer recommends in our guide which covers everything from rich winter stouts to spicy mulled cider, and explore refreshing yet comforting red and amber ales. Elsewhere in this tasty issue we have news about the latest launches, interviews with spirits creators, brewers and winemakers, food matching suggestions, and a guide to American bourbon and whisky.